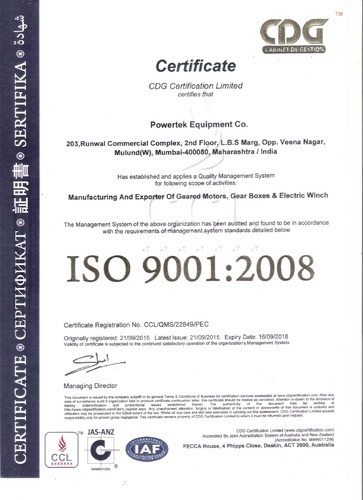 We, Powertek Equipment Company from 1998 are prominent manufacturers, exporters, and traders of high-quality Geared Motors. Offered products range consists of Planetary Gearboxes - Geared Motors, Electric Winch, and Worm Gear Boxes - Geared Motors. Recognized for their long service life, optimum performance, simple usability, rugged design, smooth finishing, and high efficiency, these products are made available in several technical specifications. Also,we provide these products at reasonable prices and within the assured time frame. Since our inception, we have backed by an ultra-modern infrastructure. Together with this, we have a team of talented professionals which work dedicatedly to provide a quality approved product which is in compliance with the client’s given specifications. Also, this helps us to cater the bulk requirements of our prestigious patrons. Apart from this, all our offered geared motors are quality assured against the industry set parameters to ensure their quality. Our Marketing Director Mr. Ravish P. Hebbarhas guided us to be able to reach suchheights. His managerial skills and ability to make good decisions, hasbeen our most valuable asset to grow rapidly. We are having iso certification. Our state-of-the-art infrastructure unit is loaded with contemporary technology and machines. This is divided into several units like manufacturing, warehousing, packaging, in-house testing and sales & marketing units. In addition to this, to manage these units of our infrastructure, we have appointed a team of skilled and talented professionals. Experienced R&D department, with latest facilities. We manufacture innovative products to meet specific clients requirement and that has been our prime concern and business philosophy since the very beginning . This has made our presence felt in the international market and broadened our clientèle. The credit of innovative product range goes to our talented team of R&D personnel's, who analyze each & every aspect like market requirements, material compatibility, dimensional properties, form & function etc, and then develop designs & models of new innovative products. Our proper R & D has enabled us to continuously add new exciting products in our range, which provides us with that extra edge over the rest of the competitors. We take pride in spreading our product range across the globe and our exclusive exclusive motors are well appreciated by people all over. Our products are superior in terms of pattern, designs and functionality, credibility, durability and more. Our goodwill in the market has enabled us to fetch repeated orders from our customers. We are committed towards engineering and producing innovative product range at a competitive price, which has assisted us in adding names to our clientèle and also retain the loyal ones at the same time. M/s. Llyods steel industries Limited. Wardha. M/s. Indian Oil Corporation Limited, Faridabad. M/s. Acc Limited, West Bengal. M/s. Oriented Prospect Active Link & Services, Malaysia. M/s. The Indian Hume pipe Co.Ltd, Mumbai. M/s. ITW India LTD. Silvassa. M/s. Grasim industries Limited, Jaipur. M/s. Synergy International FZE, U.A.E. M/s. Kabra Extrusion Technik Ltd, Daman.